Thanks buddy, haven't got round to wiping out the default phpBB mobile CSS. I'll get onto this. Mac OS X Chrome - Sometimes drop down menus open when I hover over them instead of when I click them - seems a bit inconsistent? Think I’ve fixed this - empty your browser cache/data in Chrome for barrens.chat and it should be fine. Please do let me know if the problem persists! Hey Teeb, opening the Appearance Settings loads all the 'Profile Backgrounds' on screen briefly before collapsing back into the drop-down menu. 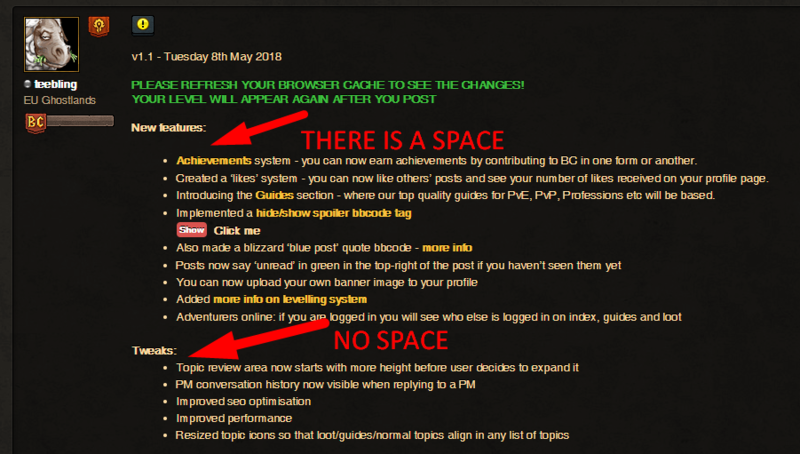 First of all I have to say that I'm a great fan of all the work done in this forum, I really love it. I also can see that a lot of detail has been put into it, my compliments to the chef. Welcome to the forum Flerex! Thank you for the kind words and for the detailed bug report. This was actually designed intentionally but I can modify it to show more than ten 'last viewers' by making the area scroll horizontally. Do you think this would be a better way of display the info? Let me know and I can make the change easily. Oh, I see. Well, to be honest my first reaction was trying to scroll horizontally so that would be a nice addition but, in my opinion, maybe there's no need to show so many users in that list. Showing only enough users to fit all available space would be more than sufficient. But, again, that's only how I see it. Maybe somebody else would tell you different. Okay thanks for the input. I think I will chop it neatly so that only so many viewers will be displayed and no viewers cut in half as is the case now. IRL I actually work as a seafarer. I joined my vessel a few days ago and will be here a month or longer. As you'd expect the internet isn't that great on the high seas so I'm limited to debugging on my local server as opposed to the live one here. However that's not to say that I have forgotten your submissions! Hopefully I will be back on the coast soon in which case I will have a 3G/4G mobile connection and will be able to update the live site with fixes. Bugs i found in 1.1 update (08/05/2018). When you are making a post / thread, sometimes it adds an empty line for no reason. When i compose a message, the avatar is different. Player name cut on profile visitors. Hey Syrurio, thanks for the reports. I broke the levelling system somehow, will try to fix tonight. 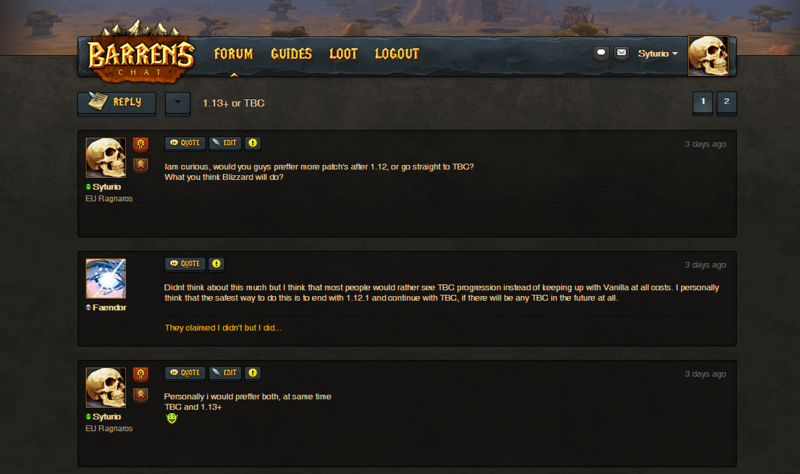 As for some of the other bugs have you definitely refreshed your browser cache/deleted site data for barrens.chat? Will look into this when I’m off shift. Yes, i refreshed / deleted all my browser data. I even tried on a different fresh installed browser, got the same results. Probably already noticed, and reported, but I will mention that the avatar on the top right is a little bit oversized for the banner. But ye i think it should be abit smaller. Level system fixed yay! Thank god I didn't completely bugger it lol that was scary to say the least. Likes system should also be fine now. Investigating the other bugs now, thank you for your submissions. I can confirm, both levels and likes are working fine now. Delete your browser cache. It will be fixed. Try again from the account -- that worked, thank you.